In my final blog about the ‘Ghost Town’ series, I’m going to look at the entire series and where the inspirations and motivations came from. To map out a nine-part series from beginning to end is a daunting task, trying to detail all the people who come in and out of the series, how they interact with each other, and keeping the story fresh, congruent, and interesting. When I first set out to write about Whiterock and Doctor Victor Tesla, the book was never intended to be a vast series. The first draft followed the hauntings of a family over the course of one night. Beyond Whiterock and the Tesla family, there’s not a lot of correlation between the new Ghost Town and that first book. That story had been written and was set aside for some time before I decided to revisit it. In making notes for a rewrite, a new direction took shape and the Ghost Town series was born. The original draft has now been reworked with a lot of its content appearing in my short story, ‘The Reaper of Geneseo Falls’ which should be released in a year or two. As the new story took shape, which was originally titled simply ‘Whiterock’, I realized that there was going to be far too many ideas for one book. I started removing concepts and changing the storyline to fit in the confines of one novel but I felt that the story was really starting to suffer. It was then that I decided to break the concepts into three distinct parts, under the banner Ghost Town; The Whiterock Incident, The Genesis Event, and Ghost Planet. I started to heavily outline the concepts that were going to be placed in each series and to make sure that I could tie everything together in a satisfying way. Once I had the outline for the entire series documented, I focused back to the start, back to the Whiterock Incident. As I read through the first drafts, once again, I felt that I had way too much content for one story, jumping from place to place, and I realized that it broke down perfectly into three more stories that worked alone very nicely. I looked over the outlines for the other two sections and everything fell into place for a trilogy of trilogies. Before I felt comfortable bringing the first book to the public, I wanted to make sure that I could write the story to the end and that the story would have a good, solid, satisfying ending. With an ending in mind, an ending that’s stayed the same from the start of the series, I had to work backwards to make sure that everything fit and worked with the final chapters. I didn’t want to get to the end only to discover that I’d boxed myself into a corner and had to make changes that could possibly change the entire series. Outline after outline, each one in more detail, emerged and I discovered that the story was fitting together perfectly, like it was meant to be written. Throughout the ‘Ghost Town’ series I worked very hard to keep all the characters congruent, always growing and developing, in ways that were natural for the situation. Often it would have been much easier to change a person, give them a talent to move the situation along quickly but I wanted each character to be true to themselves and the story. It was a daunting task but I feel that ‘Ghost Town’ completed what I set out to do; a horror story looking at revenge and redemption in a small town setting that moves larger and larger until it changes the world. With the completion of the first trilogy in the series, ‘The Whiterock Incident’, I have received great feedback and many positive comments. People were as excited for the releases of the books as I was. Now, with the release of the first book of ‘The Genesis Event,’ the second trilogy of the series, we can see how Ghost Town Labs is moving forward and how the remains of the RAW Troops and other military groups are working to stop them. 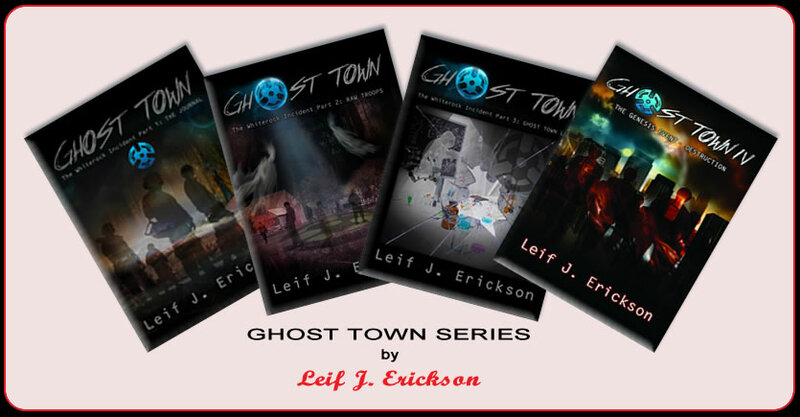 To read the ‘Ghost Town’ series head over to my website, www.leifericksonwriting.com and buy your copy today. Check out my other blogs and books and see what projects I have developing for the future. Thank you and have a great day.